Protein doesn’t build muscle directly: strength training using weights in the gym and resistance exercises are responsible for muscle growth. Consuming protein alone and protein supplements, in the absence of weight training, will not result in muscle growth. However, protein does play a vital role in the repair and recovery of muscle fibers that are broken down during muscle-building exercises. Proteins are made up of amino acids which our bodies need and use to build tissue and are a building block of bones, skin and blood – as well as muscles. When you engage in strenuous exercise, your muscle fibers become stressed and literally tear. Protein is needed in this process of repair and recovery, leading to bigger and thicker muscle fibers. The general recommendation for individuals who are exercising and keen to build muscle is to consume 1 gram of protein per pound of your desired body weight. So if you want to be 170 pounds, consume 170 grams of protein daily (1 gram of protein = 4 calories). Good sources of protein include chicken breast, fish (especially tuna), turkey, eggs, yogurt, cheese, milk. It is possible to get an adequate supply of protein by eating well-balanced meals. 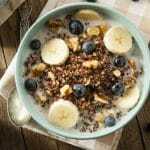 But in today’s fast-paced world when many of us eat on the go, it’s a good idea — and very convenient — to use a protein supplement to make sure you are getting enough of this important nutrient your body needs. 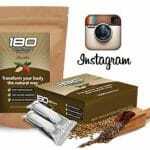 Increase your protein naturally with 180 natural protein superfood.